These two English gilt bronzed table vanity mirrors are in very good condition and are in the Rococo style. Measure: Two rectangle mirrors measure 8 x 11.25 x 1.25 inches and 8 x 11.50 x 3.25 inches. The oval frame is 8.5 x 11 x 4 inches and can be used for a mirror or picture. Bradley Hubbard B&H 19th century gilt bronze antique table vanity figural mirror. 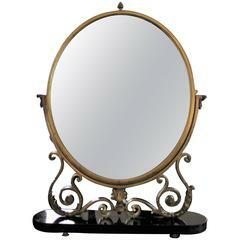 Stunning French Art Deco bronze swivel table mirror. 19th century bronze sundial with text and roman numerals and beautiful aged patina. This vintage Venetian mirror is designed to be mounted to a wall or sit on a tabletop. Beautiful Spanish mirror frame, late 19th century, bronze. This frame appeared in episode 2 of the Netflix series "Narcos Mexico". Delightful frame for mirror, with floral motifs.